Photo courtesy of Roger Gagnon, lac St-Jean, Quebec, Canada. During the weeklong 63rd Traversée internationale du lac St-Jean, the organizers offer not only the famed 32 km crossing of Lac St-Jean for professional and amateur marathon swimmers, but also the 1-2-5-10 km Uniprix race, the Défi Plouf, the amateur Marathon de la relève Rio Tinto, and a professional FINA 10K Marathon Swimming World Cup stage. Since 2007, La Traversée has ended these races at the Place de la Traverséecer, an incredible venue and calm-water harbor with plenty of spectator seating, an electronic scoreboard, medical facilities, meeting rooms, media facilities, an outdoor concert theater, and a large area for a community expo. 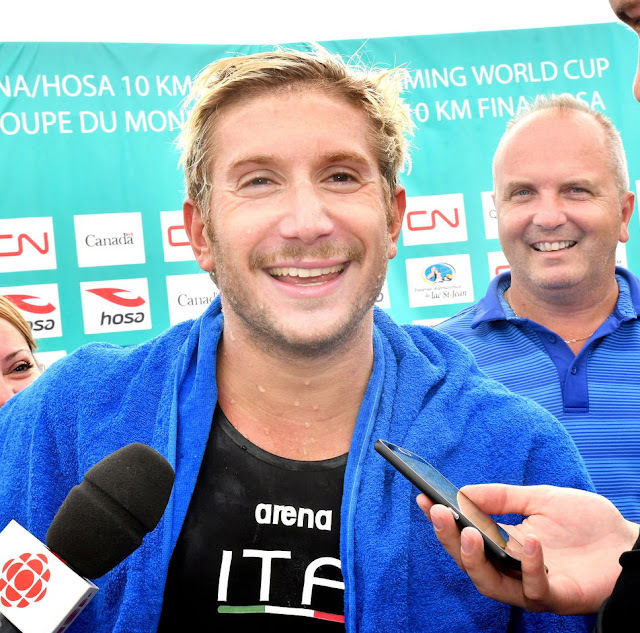 Mid-week, the FINA 10K Marathon Swimming World Cup race was staged where some of the fastest 10 km swimmers in the world gathered. With the water temperature at 20°C, there was no need or opportunity to wear wetsuits under the FINA-mandated rules. With many of the top swimmers competing just after representing their countries at the 2017. FINA World Championships in Budapest, there were relatively few surprises. But Hau-Li Fan created one of the unexpected outcomes. "I can not believe [finishing third] yet. I did not think to compete with the best. I felt good, but I was surprised by the speed of the Italians at the end. I hung on. At the end of the last buoy, I was the last of the pack and I managed to climb up." Another surprise was world 5 km champion and Olympic bronze medalist Marc-Antoine Olivier doing a DNF, but he had an ankle injury that led to him pulling out after 2 km. Ultimately, Simone Ruffini of Italy won a close race over his Italian teammate Federico Vanelli, Hau-Li Fan of Canada, and Allan Do Carmo of Brazil. Vanelli had the victory in hand until he made an unexpected navigational error towards the end of the race. Ruffini took advantage and won by 2 seconds.